This review is a piece of cake, because my verdict is unequivocal: the movie is outstanding. Easily in my Top Ten for 2015, and perhaps my Top Five. It will 'hit' home for most Americans, either because: (1) You played football, (2) Cheered for football, (3) Root for football, (4) Love someone who plays football, or (5) Love someone who loves football. Obviously, the film has a very strong point of view, takes a particular side, and is a "message movie," but I was fine with all that. Regardless its inconvenient truths, it does a nice job not shoving them down one's throat or being An Inconvenient Truth or, more recently, Truth, both of which were such vitriolic and bombastic affairs as to be virtually unbearable and unwatchable. Instead, this is a film about character, identity, struggle, sacrifice, pride, ego, courage, culture, America, money, business, science and, yes, the pursuit of truth, whatever its collateral damage or consequences, both personally and corporately. Will Smith, Albert Brooks, David Morse, and Alec Baldwin are mesmerizing. Belle's Gugu Mbatha-Raw is great, as well, and makes her small role big. 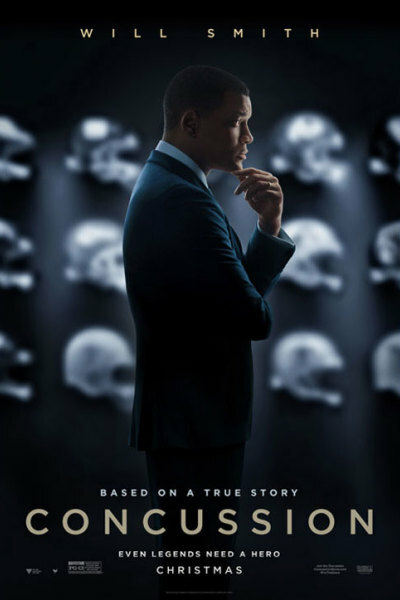 We watched Smith, Mbatha-Raw, and writer/director Peter Landesman on Charlie Rose the other night, and they spoke at length about Dr. Bennet Omalu's 2002 findings regarding Pittsburgh Steeler Mike Webster (and the NFL's reactions to Dr. Omalu's autopsy results). Smith who, in particular, has many personal friends in the NFL was very respectful and professional when asked, point blank, whether he would let his eldest son play football again, knowing then what he knows now. Paraphrasing, he replied, "After learning what I learned, I felt obligated—as a father and a human being—to participate in this film. It's not my place to make others' decisions for them, but if this film can help inform a parent's or players' decision, it will have been worthwhile." When further pressed by Charlie, Smith responded, "I'd probably tell my son, 'If it was up to me, you'd play, but you know your mother...and she says, 'No!'" Everyone laughed, but the truth was clear. And sobering. I think in one generation, football could look very, very different. In two generations, a reasonable debate could be had for whether it should exist at all. The NFL itself has admitted, on record, that at least 28% of players will suffer cognitive impairment or experience full-blown CTE (chronic traumatic encephalopathy). In his position as center, it is estimated that Mike Webster experienced no fewer than 70,000 subconcussive blows to the head during his lifetime of play. One can deduce that such guesstimates are conservative—not liberal—and therefore, any reasonable person, now playing roulette with a three-chamber revolver, will be inclined to embrace an altogether new calculus when considering whether football is suitable for himself or a son. If helmets came with the Surgeon General's warning label, for example, as do cigarettes, one can postulate that we will have crossed the cultural Rubicon. My supposition is that football will continue forever, because it is so deeply entrenched and many people simply won't care that it's hazardous to one's health, but I do predict that, like smoking, it will become more stigmatized. As Brooks' character says, "[NFL Football] owns a day of the week, having displaced God on Sundays," so any noticeable change would require nothing less than a seismic societal shift. But if marijuana can become mainstream, and a state's most envied profit center, well then, anything is possible in this country...for better or worse. My personal theory is that it will boil down to mothers. When mothers begin prohibiting or pulling their boys from football, the supply of fresh bodies will dry up. Whether this increases demand, or taints it, only time will tell. But when one mother proudly announces her boy is trying out for the team, and her friends look at her like she condones cockfighting, the tide will begin to turn. I cannot personally imagine a Friday, Saturday, Sunday without football. The sights, the sounds, the smells; the roar of the band, the drama on the field, the chatter in the stands. What would we do with ourselves and, more practically, with all those stadiums? That entire infrastructure? What could possibly replace football? Surely nothing can or will, right? And surely not every contact sport—from lacrosse to soccer—is living on borrowed time, right? You tell me. My crystal ball doesn't work that well. Is CTE to contact sports as ipads and kindles and smartphones are to newspapers and magazines? That disruptive and displacing? Will contact sports give way to something else? Something less gladiatorial and bloodsporty? Your guess is as good as mine. I really don't know the answers to such questions; no one does. Heck, we still jog, and everyone knows how damaging running is on the knee. We still lift weights, and everyone knows a lifter with a torn shoulder muscle. Is every sport that damages the body at risk of extinction? Maybe only the 'professional' ones that carry a 1 in 3 chance of brain damage are. It shall be interesting to see what sports look like in 2050, and how kindly the future judges the sports of yesteryear. "Barbarians!" "Leeching!" Or, "That was before we had CTE Sideline Kits and on-field blood draws to determine potential damage." Do add it to your holiday schedule, for sure; you won't be disappointed, regardless your position.